You'd be forgiven if, after stepping into Melanie Dunn's Pâtisserie Mélanie in Hillcrest, you thought you had been transported to a sweet little Parisian bakery. French posters and art rest on soft blue walls. 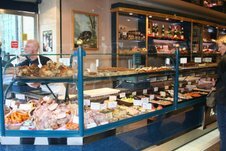 A counter is stocked with pastries, baked in small batches. There's a small seating area and vintage/retro housewares and cookbooks for sale. It's very sweet, very sophisticated, and reflects Dunn's pastry training at Le Condon Bleu in Paris over three summers. Heck, she and her husband and young daughter even live above the shop. It's where Dunn does her baking with an assistant. The pastries are stunning. Flaky butter, chocolate, and pistachio croissants. Pain aux Raisins. Chocolate and lemon tarts. Cannelés Bordelais. 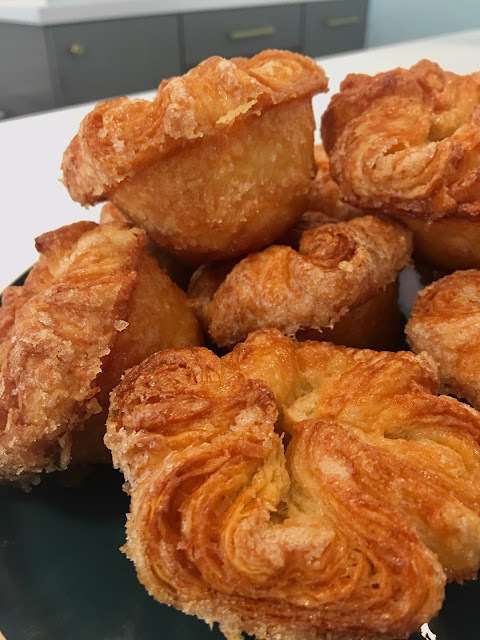 And, oh, Kouign-Amanns, both classic and cinnamon. Dunn also makes caramels, macarons (of course), sable cookies, and preserves. The flavors change with the seasons. 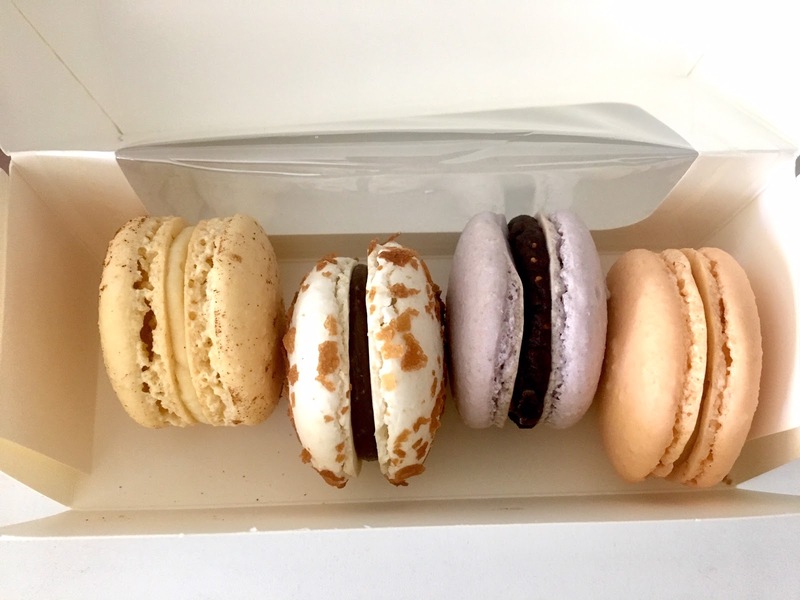 In fact, her holiday collection--Macarons "Les Fêtes"--is a box of four apple cider, fig, hazelnut, and pumpkin macarons. Dunn opened Pâtisserie Mélanie on Valentine's Day 2018. Previously, the native Hawaiian had been an English teacher at Crawford High School for 15 years. She had thought about being a graphic designer. Then she applied to law school and got into USD. But law school wasn't for her so, with some experience teaching, she opted instead to get her teaching credential. 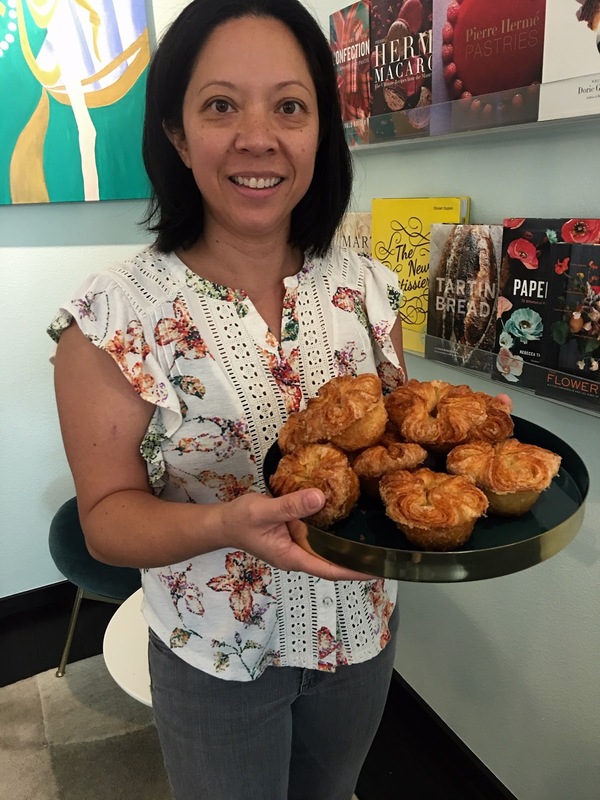 All the while she felt she wanted something else and at the 10-year point as a teacher, burnt out and ready for a change she headed into a direction that had always intrigued her: baking. "I was a picky eater as a child and didn't get to eat desserts, which made me obsessed with them," she says. "I have a persona that likes things just so and that fit with baking." Dunn (who taught and is friends with San Diego chef Katherine Humphus) made use of her summer vacations from teaching to attend Le Cordon Bleu in Paris for eight-week sessions focused on pastry. After three years she earned her Diplôme de Pâtisserie. Initially, her plan was to stop teaching and work in the industry. But around 2015 she and husband Axel Schwarz, also a teacher, started house hunting. They stumbled upon a townhouse in Hillcrest on Park Blvd. that had a large room at the entrance, with the rest of the space behind the room and upstairs. That front room could be a bakery--and with new cottage food laws in place, she could do her baking in her own kitchen. It took awhile to make it all work, mostly because she decided to pause her plans with the birth of her daughter. But by the beginning of 2018 Dunn was ready to launch. Now she's contemplating ways to expand. I spent a wonderful morning with Dunn, learning how to make her Kouign-Amann. This is a Breton cake, filled with butter and still more butter. It's the perfect introduction to lamination--the process of folding butter into dough to get the flaky layers you enjoy in puff pastry and croissants. There aren't nearly as many turns with Kouign-Amann, so if you've been wanting to try making a laminated pastry, this is perfect. And, damn, they're both delicious and beautiful! It also takes awhile. 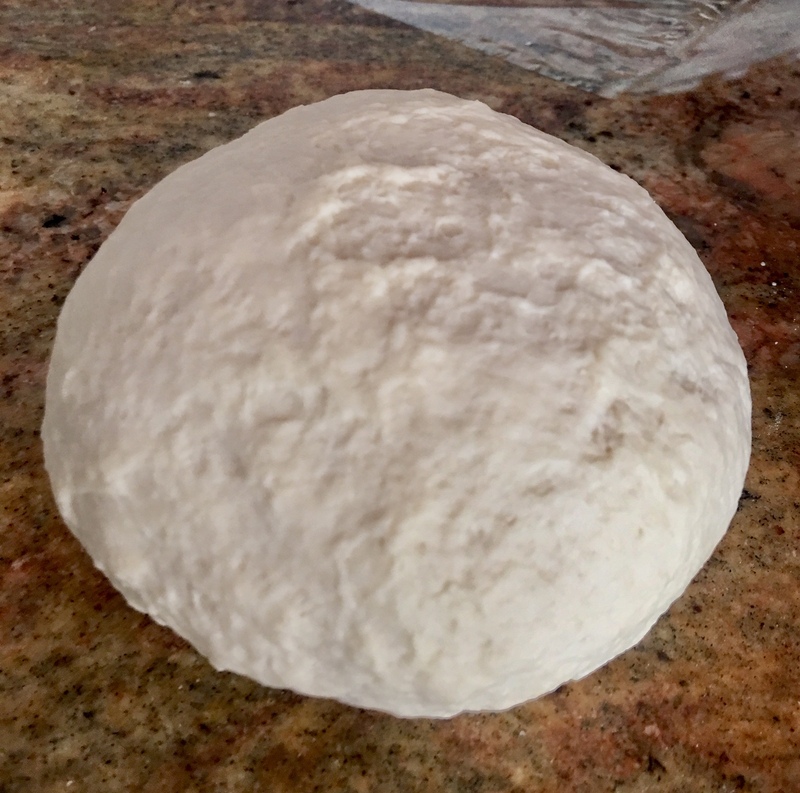 Dunn suggests making this a weekend process with the first day making the dough, then refrigerating it overnight and returning to it the next day to roll, fold, and bake the pastries. This recipe makes 9 good-sized pastries. You can mix the dough in a 4-quart stand mixer using a dough hook, but if you have the larger 6-quart bowl, the hook won't engage. The recipe is too small. So, you can either double the recipe--or do what Dunn did and mix it by hand. Let's do it by hand. It's pretty easy, especially if you have a thin scraper to pull ingredients from the side of the bowl. You'll start with flour, salt, and 10 grams of unsalted butter in a bowl. Rub the butter into the flour-salt mixture to incorporate it. Then mix together year with water and add it to the flour mixture, using the scraper to bring the ingredients together to form the dough. Once it's all mixed, turn it out onto your counter (I have a marble slab that works well; granite countertops are equally good.). You'll knead the dough for up to 8 minutes until it has an elastic quality. Shape it and wrap it in plastic and let it chill overnight. The next day, you'll preheat the oven, depending on whether you have a convection or conventional oven, to either 350 or 375 degrees. Then you'll get out your butter (Dunn suggests that it be at least 85 percent butter fat) and shape it into a rectangle (you could also do this the day before and wrap it up to chill). Now it gets real. You're going to start laminating. Pull the dough from the fridge and use just enough flour on the counter--or "bench"--to keep it from sticking. Roll it into a long rectangle, the same width as the butter's length and place the butter in the center. Now fold the top and bottom of the dough over the butter so they meet in the middle. 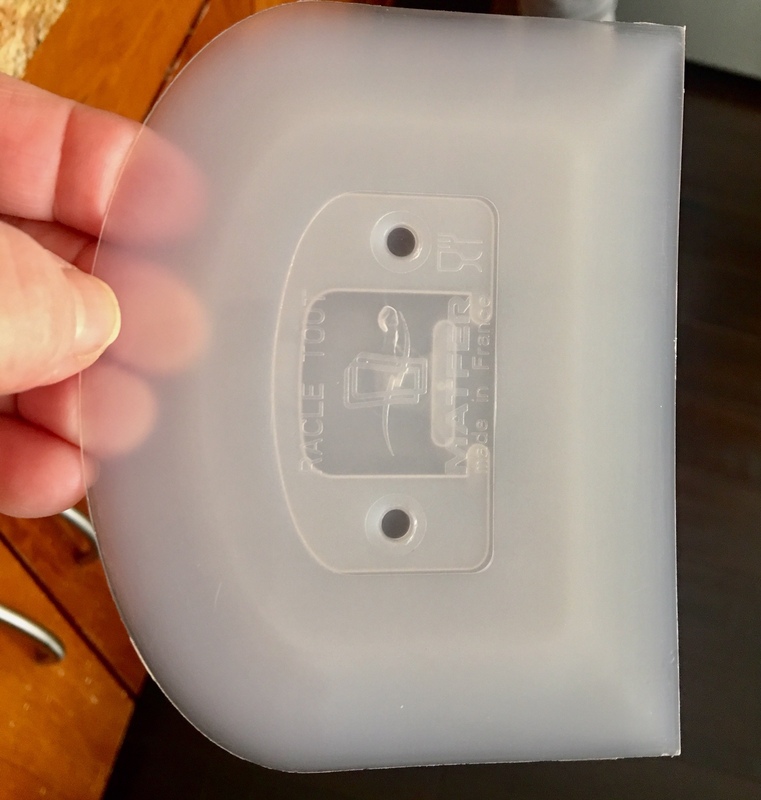 Turn it over so the seam is underneath. Dunn's helpful hint is to create a grid of indentations using your rolling pin to help you roll the dough straight. Then roll it out to 24 inches in length. Now for your first fold. It's called a "double book fold"--what that means is you'll fold one end to mid point of length of dough over the butter, fold the other end to same mid point, then fold one 'side' of the book on top of the other. Now you'll create another grid of indentations and roll it out again. Then you'll do a letter/envelope fold, meaning you fold it in thirds. One end is folded two-thirds of the way up the length of the dough. Then you'll pull the other end over to the opposite side to cover the first fold. Wrap the dough in plastic and let it rest for at least an hour. Now it's time to get it ready for baking. Get out one of your muffin/cupcake pans. Set it aside, along with a ruler and a knife. Sprinkle half the sugar on the bench. Unwrap the dough and place it on top, then sprinkle the rest of the sugar on the dough. Roll out the dough and do your last turn, an envelope fold, and sprinkle any remaining sugar on the bench onto the dough. Roll the dough into a 12-inch square. Using your ruler, mark a 3 by 3 grid of 9, with each square 4 inches. Trim the edges so they're straight and cut out the squares. With each square, you'll pull in the four corners and press into the center. Place/push each piece into a muffin pan opening and gently press the center down. Dunn suggests using the outer spaces. Bake! It'll be about an hour for the convection oven and an hour and 15 minutes for conventional ovens. Get out a rack while they're baking and place it on a parchment paper-lined sheet pan to catch drips. The butter will leave a pool at the bottom but what you're looking for is a caramelized, golden brown bottom. The best tool for pulling out the pastries is a pasta tongs, Dunn says. When they're done, place each pastry upside down on the rack to cool. Then eat! Oh, you did it! Place flour, salt, and 10 grams of butter in a bowl and rub the butter into flour-salt mixture. Mix yeast with water and add to flour mixture. Use a thin scraper to bring ingredients together and form dough. Turn dough onto counter or other surface and knead from 6 to 8 minutes until it develops elasticity. Shape the dough into a square, double wrap in plastic wrap, and place in a ziplock bag. Chill in refrigerator overnight. Pre-heat oven to 350 degrees for a convection oven and 375 for a conventional oven. Place the 225 grams of butter on a piece of parchment paper. Using a rolling pin smack it around and roll it out into a 5-inch by 7-inch rectangle. It should be about the same texture as the dough. Set aside. Remove dough from refrigerator, unwrap and, using just a little flour to prevent sticking, roll it out into a 10-inch by 7-inch rectangle. Place the slab of butter in the center. Its length should be equal to the rolled out dough's width. Fold top of the dough over the butter so it reaches the halfway point of the butter. Repeat with the bottom of the dough. Turn over so it’s seam side down and with the rolling pin, create a grid of indentations to help you roll the dough straight. Roll the dough out to 24 inches long. Do one double book fold (fold one end to mid point of length of dough over the butter, fold the other end to same mid point, then fold one 'side' of the book on top of the other). Create another grid of indentations and roll out again. Do a letter/envelope fold (fold in thirds = fold one end two-thirds of the way up the length of dough, then take the other end and stretch it to the opposite side to 'cover' the first fold ). Wrap it in plastic and let it rest for at least one hour. Sprinkle half the sugar on the bench—your flat surface. Unwrap and place dough on top. Add the rest of the sugar on the dough. Roll to 22 inches by 9 inches. Do one envelope fold and then sprinkle any sugar remaining on the bench on top. Roll to a 12-inch square. Using a ruler, mark a grid of 9 (3 by 3). Each small square should be 4 inches. Trim the edge so they’re straight, then cut the grid into squares. Take one square and fold in all four corners, pressing toward the center. Place into a muffin cup and gently press the center down. Repeat for each around the edges of the muffin pan. Bake at 350 degrees in a convection oven for about an hour or 375 degrees in a conventional oven for about an hour and 15 minutes. Check for caramelization by lifting up one of the pastries with a pasta tongs and looking at the bottom. If it’s still a little light and a little wet, return the pastry to the muffin cup and bake another 5 minutes. Check again. The bottom should be golden brown and caramelized. Prepare a rack by placing it a sheet pan lined with parchment paper (to catch the butter and sugar drips. Remove each pastry immediately from the muffin cups and place upside down on the rack to cool. Pâtisserie Mélanie is located at 3788 Park Blvd., Suite 4 in Hillcrest. Trish Watlington of Two Forks Farm (and former owner of The Red Door) is the founder of Farm to Fork San Diego, a membership organization of local farmers, chefs/restaurants, fishermen, distilleries, wineries, caterers, and related professionals that focuses on supporting local food, farm families and their workers, and reducing greenhouse gas emissions by lowering the number of miles food travels to the plate. Farm to Fork San Diego helps consumers and others interested in supporting this mission by verifying through local farmers that participating chefs and restaurants are actually buying from them. 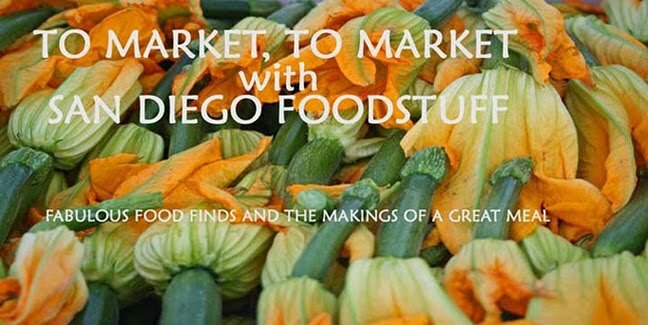 Now I can only think of two times I've let someone guest post on San Diego Foodstuff in the blog's 11 (almost 12) years. 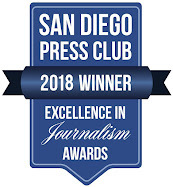 But as a member of Farm to Fork San Diego I want to help Trish highlight some of the amazing offerings other members have for holiday gifting. So, I'm turning today's post over to Trish. You'll love these unique gift ideas! Struggling to find fabulous gifts and stay true to supporting local farms, friends, and neighbors? Or maybe you’re just looking for something unique or delicious that your family or co-workers will absolutely love. Farm to Fork San Diego has the perfect gift guide for San Diegans who want to pick up a fabulous gift and stay close to home. Fork over a locavore feast with these unique tokens of holiday giving. Cider from award winning Bivouac Ciderworks, brewed right in North Park is a rich, refreshing, complex and intoxicating beverage good for any occasion. Farm to Table gift baskets from Garden Kitchen’s 100 percent scratch kitchen are full of local artisan jams, pickles, tea towels and soaps. Stop by Garden Kitchen to pick one up. How about a little glitz and glam with gourmet local food. Grab a gift card to Kettner Exchange or gift tickets to any of the their upcoming events. Go hog wild with some tickets to BIGA’s Third Anniversary Hog Roast. Find holiday cheer and locavore luxuries at the Little Italy Wednesday or Saturday markets. From apples to zany custom creations, San Diego Markets have everything for everyone. Make a memory with friends and family. 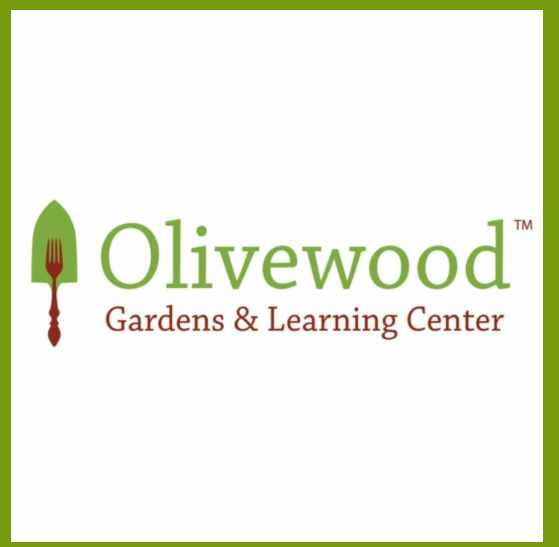 Join a cooking or gardening class at Olivewood Gardens. Meet new friends, learn new skills, and enjoy a day in a beautiful organic garden. 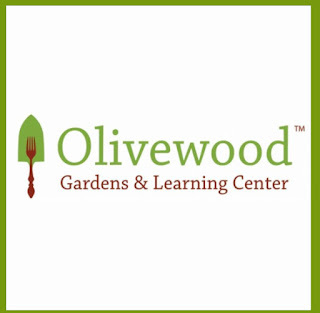 All proceeds support the garden and nutrition education programs at Olivewood Gardens and Learning Center. Grab some of your favorite folks and build a private food, farm, and libation tour. Whether your group is 4 or 40, Epicurean San Diego has an experience just for you. Relax with friends, music and wine at Ramona Ranch Winery while selecting unique gifts including award-winning wines, jewelry, gift cards, and more from specialty vendors and family artisans. Outfit the gardener in your life. Our friend Nan Sterman, host of KPBS TV’s A Growing Passion, has the perfect book for plant lovers wanting beauty while still being mindful of water saving. Order a signed copy of Hot Color, Dry Garden or any of Nan’s books here. Mission Hills Nursery can fill all your gardening gifts from gnomes to tools. Or stop by to pick up a Christmas tree. Buy them Soil Food, humus-rich compost made locally in small batches, or a compost bin to make their own. Food2Soil is a compost collective reducing the amount of food waste that lands in landfills. Gift locally grown and climatically adapted seeds from our very own San Diego Seed Company. Choose some of your favorite varieties or buy a gift certificate so that gardeners can choose their own. Or check out all the local member farms, restaurants, and businesses at www.farmtoforksd.com. And join us January 12-19, 2019 for Farm 2 Fork San Diego's Local Libations Week, focusing on local beverages and their place with and without food. Caron promises more information here on the various events coming up, but we launch at BIGA with their Third Annual Hog Roast and tap takeover on the 12th (see above).